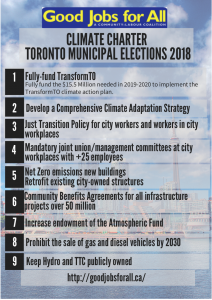 In Toronto’s October 22, 2018 Toronto municipal election, we must demand action against climate change. The Good Jobs for All Coalition created the Election Charter for Climate Justice to support action now and after the election. It contains nine great measures that should be included in the City’s ongoing program to meet our greenhouse gas reduction targets. Download the short version of the Charter or the longer version.